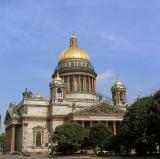 My summer 2005 trip to Russia: St Petersburg, Novgorod, Moscow and Yaroslavl. Russia is a riddle wrapped in a mystery inside an enigma. St Petersburg, the words actually say "Leningrad"
Outstanding collection of photos here. Was in Moscow and Leningrad back in '83. Wish I'd had a digital camera back then. Very nice gallery. I'll have to get there myself.